A girl in her early teens was the victim of an attempted abduction in Ferbane, Co Offaly yesterday evening. 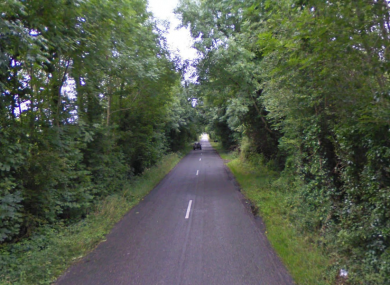 The road between Ferbane and Clonlyon, where the attempted abduction occurred last night. GARDAÍ HAVE ISSUED an appeal for public help in establishing the circumstances surrounding an attempted abduction in Co Offaly last night. The incident occurred at around 8:30pm yesterday evening, when a girl in her early teens was cycling to a friend’s house outside Ferbane. A man driving a white van – described as ‘car type’ – pulled up alongside her. He engaged her in conversation for a few moments before trying to pull the girl into the back of the vehicle. The girl was able to escape following a brief struggle, after which the man drove off in the direction of Ferbane town about 2km away. The man is described as being middle-aged, small in stature and with dark hair. He was wearing glasses at the time of the incident. The attempted abduction took place at the townland of Moyclare, on the R437 road between Ferbane and Clonlyon. Witnesses with information can contact Gardaí in Birr at (057) 9169710, the Garda confidential line at 1800 666 111, or any Garda station. Email “Gardaí investigate attempted abduction of Offaly girl”. Feedback on “Gardaí investigate attempted abduction of Offaly girl”.